What Is a Lap-Band ? 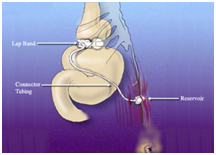 "Lap-Band System" is the brand name of the adjustable gastric band used in the procedure. Most simply, a Lap-Band is a silicone belt that goes around the top of the stomach. This results in the ability to control your hunger and achieve a "feeling of fullness," or satiety. Ultimately, you eat much less and should feel full sooner. A key component of the Lap-Band System is its adjustability. The band is connected to a port, which enables the device to be inflated over time to expedite the weight loss. Who Are Candidates for the Lap-Band System? The requirements for Lap-Band surgery are the same as for any other weight loss surgery. These criteria were originally set in the early 1990s and have not changed. If your BMI, or body mass index, is between 35 and 39, then you must also have associated severe medical problems, or co-morbid conditions, in order to be a candidate for the Lap-Band. These conditions usually include diabetes, hypertension, or high cholesterol. But if your BMI is greater than 40, then it is not required that there be any associated medical problems. Most insurance companies also require a history of previous attempts at weight loss. How stringent these requirements are can differ from one insurance company to another. Many people do not meet the NIH requirements or do not have the insurance benefit for weight loss surgery, but they may still be able to pursue the procedure by paying for it themselves. 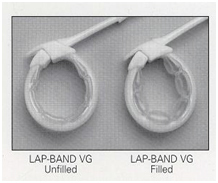 The lap band is considered a "restrictive operation." This operation is performed laparoscopically which means five to six small incisions are made to insert a small camera and tools needed to perform the operation. Like a wristwatch, the band is fastened around the upper stomach to create a new, tiny stomach pouch that limits and controls the amount of food one can eat. It also creates a small outlet that slows the emptying process into the stomach and the intestines. As a result, patients experience an earlier sensation of fullness and are satisfied with smaller amounts of food; this results in weight loss. The band is connected by tubing to a port that is placed under the skin during surgery. After the operation, the surgeon can adjust the amount of saline in the band by entering the port with a fine needle through the skin. The band can be inflated or deflated with saline solution, which affects the amount of food one is able to consume. Injecting saline into the port inflates the band, making the passage to the lower part of the stomach smaller, which further restricts food intake. Fluid can easily be removed in the doctor's office if it is too tight. 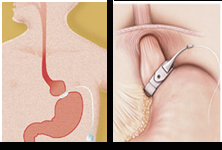 How does laparoscopic gastric banding work? Following surgery, you should be able to return to work within a week, with minimal discomfort. You will need to follow a nutrition plan (which may include vitamin supplements) prescribed by your surgeon and/or nutritionist. The nutrition plan will likely include a liquid diet for a few weeks, until you can tolerate soft foods, and later solid foods. A specific exercise program, as well as behavioral-modification therapy, may also be recommended. Frequent office visits are mandatory to adjust the band. Your surgeon or his assistant will be able to inject the port in the office. On average, patients require six to eight adjustments of the band during the first 18 months following Lap-Band surgery. Patients typically lose 50% to 60% of their excess body weight within two years after the procedure. Additional plastic surgery may be indicated, depending on how much weight is lost. Easy to cheat .. if chocolates or sweets taken. As with any surgical procedure, there are known risks. Besides the standard risks of most procedures, including bleeding and infection, there are complications specific to Lap-Band surgery. Slippage of the band can occur as you lose weight and the stomach goes above the band, causing heartburn or vomiting. This can usually be fixed laparoscopically. Rarely, the band may erode into the inside of the stomach. The band can spontaneously deflate because of leakage. That leakage can come from the band, the reservoir, or the tubing that connects them. The stomach pouch can enlarge. The stoma (stomach outlet) can be blocked.